The red pin represents Brentwood Elementary Science Magnet. While middle school is largely believed to be where bullying occurs most often, the LA Unified schools where the highest majority of students reported that bullying was a problem were elementary schools, according to surveys about safety in schools. Of the 24 schools where the largest percentage of students reported that bullying was a problem at their school, 20 were elementary schools. The question was asked in a school climate survey taken by students and staff in the 2015-16 school year. This news organization recently published results of the school climate surveys in a searchable map, allowing parents for the first time to compare their child’s school to others throughout the district. Look up your child’s school here. Note that the percentages for each school include students who reported they “disagree a lot,” “disagree a little,” and “neither agree nor disagree” to the question “Bullying is NOT a problem at my school.” You can read the methodology behind how the map was created and how the surveys were used here. Elementary schools generally serve kids in kindergarten through fifth grade. Also of note, there are more elementary schools than other types of schools in the district. 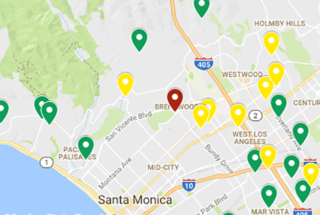 Brentwood Elementary Science Magnet is the only school in the Pacific Palisades, Brentwood and West LA area that is categorized as “less safe.” All of the other schools in the area are either green or yellow. The four middle schools on the list where students said bullying was an issue are in South Los Angeles. Most of the elementary schools are also in South LA. Saticoy Elementary is the only school on the list in the San Fernando Valley — it is in Panorama City. Annalee Avenue Elementary and Barton Hill Elementary are in the South Bay. The district’s new discipline policy called restorative justice was first rolled out in the 2014-15 school year. Implementation has been incremental across the district. Of the 185 schools that first received training in restorative justice practices, only 43 — or 23 percent — were elementary schools. The district made high schools and middle schools priorities at the program’s start. As of this past school year, 492 schools are using restorative justice. Of those, 255 — or 52 percent — are elementary schools. Restorative justice is a less punitive approach to school discipline that the school board approved in 2013 to reduce the number of suspensions. It seeks to resolve conflicts through talking circles with students involved and other more progressive means. Here are resources from the district on bullying. The data reflects responses from 786 district and charter schools across the city that participated in surveys given in the 2015-16 school year, the most recent available. (The district reports having “over 900” traditional public schools as well as 187 charters.) Only a small portion of charter schools participated in the survey and made their data available. *This article has been updated to add the number of schools that participated in the survey, and that only a small number of charter schools made their data available. It has also been updated to include the methodology behind the percentages.